My research interests include feminist cultural studies, gender and media globalization, South Asia, and postcolonial studies. I am interested in feminist and international cultural studies inquiry that bridges the disciplines of media studies, women’s studies, and South Asian studies. A consistent theme that runs through my research is the complexity of gender as a multidimensional social category whose meaning evolves only in relation to other social formations of race, class, caste, race, and ethnicity. My work emphasizes the ways in which historical and economic processes-colonialism, nationalism, and globalization-shape the social construction of gender and modernity. In addition, my analysis of global and local media culture through the lens of postcolonial theories contributes to the growing field of postcolonial media studies, a recent intellectual direction in international communication. I have employed a range of qualitative methods including participant observation, focus groups, in-depth interviews, textual analysis, and discourse analysis to address these broad questions. I remember arriving in the United States as an M.A. student from India more than two decades ago and enrolling in my first seminar course at Texas Christian University with Jackie Beyers, the leading scholar in feminist media studies. I can still today recall vividly the thrill of wrestling with the concerns of critical humanities ethnographic research in her inspiration course. Although I could not understand fully the impact of Jackie’s seminar on my life at the time, I can see now with hindsight that I had stumbled upon my research anchor and intellectual community. Framed by post-colonial and globalization theory and feminist cultural studies, the seeds for my dissertation research at the University of Iowa on young Indian women’s appetite for British romance novels were actually sown in that very first course. To this day, I feel privileged to work on topic’s that matter greatly to me, as a woman, as an immigrant, and a bicultural citizen of America. My feminist media scholarship allows me to rise above the gratification of individual empowerment to try to understand the vast historical distance I have traveled from my paternal grandmother, incredibly smart and strong, but not allowed to get a formal education or work outside the home, and she had 11 children. Thanks to progressive thinkers and doers and collective global, social movements, I have inherited opportunities that were simply unknown to my brilliant grandmother. Following from this, my research interest has centered on a set of key concerns. How do the media represent the changes in India’s status from a third-world nation to a rising power? Where do media representations of beauty, femininity and women’s progress fit into the larger trajectory of India’s economic transition? More recently, I’ve also become interested in the Indian diaspora in America. I am now working on a project near and dear to my heart, tracking the growing number of Indians in journalism. My research and teaching are inseparable companions. I teach courses on media globalization, gender, research methods, theory and pedagogy, where I get to share all kinds of exciting work in these areas and hopefully motivate my own students to find their fulfilling paths, like my own professor, Jackie Beyers, did for me. My research has been published in a variety of academic journals including Global Media & Communication, Journal of Communication, Journal of Children & Media, Communication, Culture, & Critique, Journal of Communication Inquiry, Critical Studies in Media Communication, Communication Theory, Qualitative Inquiry, Communication Review, and Frontiers: A Journal of Women’s Studies. Parameswaran, R., & Cardoza, K. (2009). Melanin on the margins: Advertising and the cultural politics of fair/light/white beauty in India. Journalism & Communication Monographs. 11 (3), 213-274. Parameswaran, R. (2001). Global media events in India: Contests over beauty, gender, and nation. Journalism & Communication Monographs, 3 (2), 53-105. Parameswaran, R. Editor. (2013). Audience and interpretation in media studies. Volume 4, International encyclopedia of media studies. Boston: Wiley-Blackwell. This volume consists of 24 chapters authored by leading and emerging scholars from Australia, Denmark, U.K, Singapore, India, China, and the United States who teach and do research in media studies, journalism, and communication studies. Parameswaran’s original introduction for the book assesses the state of audience research and lays out some productive directions for future work in the area of global audience studies. 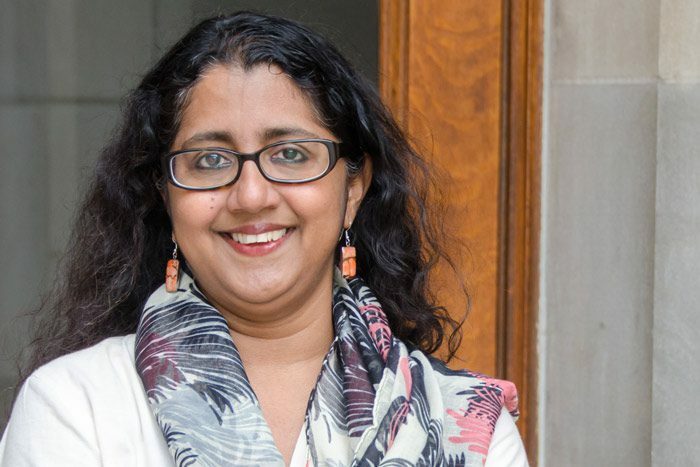 She is currently involved in two major research projects: one on Indian diaspora journalists in the United States and another on media discourses of resistance against light-skinned beauty norms, racism, and colorism in India. Two-time Recipient of the Gretchen Kemp Teaching Award for Outstanding Teaching, School of Journalism, Indiana University, 2011 & 2002. Trustees Teaching Award, School of Journalism, Indiana University, Spring 2009. TERA (Teaching Excellence and Recognition Award), School of Journalism, Indiana University, 2000. Outstanding Teaching Assistant Award, 1996. Universiy of Iowa. Parameswaran, R, Verghese, R & Chitrapu, S. (2018). An Incomplete Journalism Parivar: The Story of India’s Missing News Magazine Industry. Book chapter in Indian Journalism in a new era: Changes, challenges, and perspectives, Ed. Shakuntala Rao. Oxford University Press. Kumar, S. & Parameswaran, R. [Equal contributions]. (2018). Charting an itinerary for postcolonial communication and media studies. Journal of Communication. 68 (2), 347-358. Parameswaran, R. & Rao, P. (2018). Imagining, imaging, and implementing India. Commentary essay. Journalism & Communication Monographs, 20 (1), 74-79. [First author]. Parameswaran, R. (2015). Animalizing India: Emerging signs of an unruly market. Consumption Markets & Culture. Online first. DOI:10.1080/10253866.2015.1052966. Parameswaran, R. (2014). Globalization, beauty regimes, and mediascapes in the new India. Chapter in C. Carter, L. McLaughlin, & L. Steiner (Eds. ), The Routledge Companion to Media and Gender (363-373). New York, NY: Routledge. Birthisel, J. & Parameswaran, R. (2013). Postings on the rise of the rest: Tracking online reception to the Post-American World. Journal of Communication Inquiry, 37 (3), 217-232. with equal contributions. Parameswaran, R. (2013). Media culture and childhood in the age of globalization. Chapter in D. Lemish (Ed. ), Routledge Handbook on children, adolescents, and media (75-82). New York, NY: Routledge. Parameswaran, R. (2012). Watching Barkha Dutt: Turning on the news in television studies. Special issue “Beyond TV: South Asian History and Culture.” South Asian History & Culture, 3 (4), 626-635. Parameswaran, R. (2012). Studying the elusive audience: Readers, viewers, users, and consumers in a changing world. In R. Parameswaran (Ed. ), Audience and interpretation in media studies (13-36). Volume 4, International encyclopedia of media studies. Boston: Wiley-Blackwell. Parameswaran, R. (2011). Producing cosmopolitan citizens: Journalism and communication in the U.S. Academy. Chapter in B. Zelizer (Ed. ), Making the University Matter (pp. 241-248), Routledge Series Shaping Inquiry in Culture, Communication, & Media Studies. New York, NY: Routledge. Parameswaran, R. (2011). The rise of China and India: Promising new directions for global media studies. Global Media and Communication, 6 (3), 285-292. Parameswaran, R. (2011). E-raceing color: Gender and transnational visual economies of beauty. Chapter in R. Hegde (Ed. ), Circuits of visibility: Gender and transnational media cultures (68-86). New York, NY: NYU Press. Parameswaran, R, & Chitrapu, S. (2011). Women’s movement media in India. In J. Downing (Ed. ), Encyclopedia of social movement media (pp. 542-547). Sage Publications. Parameswaran, R. (2009). Moral dilemmas of an immoral nation: Gender, journalism, and sexuality in the film Page 3. The Image of the Journalist in Popular Culture, 1 (1). Parameswaran, R. (2009). Facing Barack Hussein Obama: Race, Globalization, and Transnational America. Journal of Communication Inquiry, 33 (3), 195-205. Parameswaran, R., & Cardoza, K. (2009). Immortal comics, epidermal Politics: Gender and representations of skin color in Amar Chitra Katha. Journal of Children and Media, 3 (1), 19-34. Parameswaran, R. (2008). The other sides of globalization: Communication, culture, and postcolonial critique. Communication, Culture, and Critique, 1 (1), 116-125. Parameswaran, R. (2008). Reading the visual, tracking the global: Postcolonial feminist methodology and the chameleon codes of resistance. Book chapter in the Handbook of Critical Indigenous Methodologies. Thousand Oaks, CA. Sage Publications. (35 pages). Parameswaran, R. (2006). Military metaphors, masculine modes, and Orientalist others: Deconstructing journalists’ inner tales of September 11. Journal of Communication Inquiry, 30 (1), 42-64. Parameswaran, R. (2005, October-December). Global beauty queens in post-liberalized India. Peace Review: A Journal of Social Justice, 419-430. Parameswaran, R. (2005). Journalism and feminist cultural Studies: Retrieving the missing citizen lost in the audience. Popular Communication, 195-208. Parameswaran, R. (2005). Spectacles of gender and globalization: Mapping Miss World’s media event space in the news. The Communication Review, 7 (1), 371-406. Parameswaran, R. (2004). Global queens, national celebrities: Tales of feminine triumph in post-liberalization India. Critical Studies in Media Communication, 21 (4), 346-370. Parameswaran, R. (2003). Resuscitating feminist audience studies: Revisiting the politics of representation and resistance. Chapter in A. Valdivia (Ed. ), Blackwell research companion to media studies (pp. 311-336). Oxford, UK: Blackwell Publishers. Parameswaran, R. (2003). Reading Nancy Drew books in urban India: Gender, postcolonialism, and memories of home. Chapter in A. Lundin & W. Wiegand (Eds. ), Defining print culture for youth: The cultural work of children’s literature (pp. 169-195). Westport, CT: Libraries Unlimited. Parameswaran, R. (2002). Reading fictions of romance: Gender, sexuality, and nationalism in postcolonial India. Journal of Communication, 52 (4), 832-851. Parameswaran, R. (2002). Local culture in global media: Excavating colonial and material discourses in the National Geographic. Communication Theory, 12 (3), 287-315. Parameswaran, R. (2001). Feminist media ethnography in India: Exploring power, gender, and culture in the field. Qualitative Inquiry, 7 (1), 69-103. Editor of Communication, Culture & Critique, one of the International Communication Association’s flagship journals, from 2014-2016. 2015 Teresa Award for “Outstanding contributions to feminist scholarship.” Feminist Scholarship Division of the International Communication Association. Faculty Judge for the Peabody Awards in Electronic Journalism. Invited Research Expert, Junior Faculty Mentoring Workshop, University of Michigan, Ann Arbor. Member, Advisory Board, Framing the Global, a five-year initiative of Indiana University Press and the Indiana University Center for the Study of Global Change, funded by the Andrew W. Mellon Foundation. Visiting Professor, Summer 2010 Maymester program, University of Colorado, Boulder. Visiting Research Scholar, Annenberg School of Communication, University of Pennsylvania, Spring 2009. Top Faculty Paper Award. (2009). Ethnicity and Race in Communication Division. International Communication Association. Served as Faculty Research Expert, National Communication Association. Annual Doctoral Honors Seminar, University of Colorado, Boulder, Summer 2007. Mary Yodelis Smith Award. (2004). Association for Education in Journalism and Mass Communication, Toronto, Canada. Nominated for Outstanding Junior Faculty Scholar Award. (2004). International Communication Association. First Place Faculty Paper Award. (2003). Critical and Cultural Studies Division. Annual Convention of the Association for Education in Journalism and Mass Communication, Kansas City, Mo. Nominated for Outstanding Junior Faculty Scholar Award. (2003). Feminist Scholarship Division, International Communication Association. First Place Faculty Paper Award. (2002). Critical and Cultural Studies Division. Annual Convention of the Association for Education in Journalism and Mass Communication, Miami, Fla.
First Place Faculty Paper Award. (2001). Commission on the Status of Women. Annual Convention of the Association for Education in Journalism and Mass Communication, Washington, D.C.
First Place Faculty Paper Award. (2001). Critical and Cultural Studies Division. Annual Convention of the Association for Education in Journalism and Mass Communication, Washington, D.C.
First Place Student Paper Award. (1996). Qualitative Studies Division. Annual Convention of the Association for Education in Journalism and Mass Communication, Anaheim, CA. (co-authored paper). Kappa Tau Alpha Research Paper Award. (1996). National Honor Society in Journalism and Mass Communication, Association for Education in Journalism and Mass Communication. John Murray Outstanding Doctoral Student Award for Research. (1995). School of Journalism and Mass Communication, University of Iowa. Ada Johnson/Otilia Maria Fernandez Women’s Studies Award. (1995). Outstanding Performance in Women’s Studies Courses, Women’s Studies Program, University of Iowa. Ph.D. (Mass Communication), University of Iowa, Iowa City, Iowa. M.S. Media Studies, Texas Christian University, Fort Worth, Texas. M.C.J. (Master’s degree in Communication & Journalism). Osmania University, India. Associate editor, Dryden Press, Fort Worth, Texas, 1993; editorial intern, Harcourt Brace College Publishers, Fort Worth, Texas, 1992; assistant editor, Orient Longman Ltd., Hyderabad, India, 1988-90; public relations assistant, Tata Group of Companies, Bombay, India, 1988; reporter and columnist, Citizen’s Evening, Hyderabad, India, 1987-88; freelance feature writer, Hyderabad, India, 1985-1990.